By hungry runner on February 18th, 2011 . Filed under: Gifts, Kitchen . I frequently find myself wishing I lived in Eurpoe. Things seem to be so much more sophisticated and lovely across the sea. 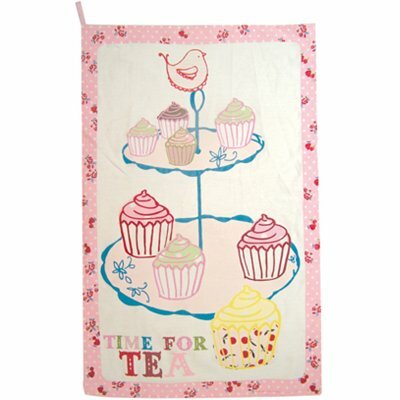 When I came across John Lewis’s site I immediately wished I had a UK shipping address so I could buy the Flutters and Fancies Tea Towel, £6.99, which has the image of a cake stand filled with cupcakes and a bird on top. 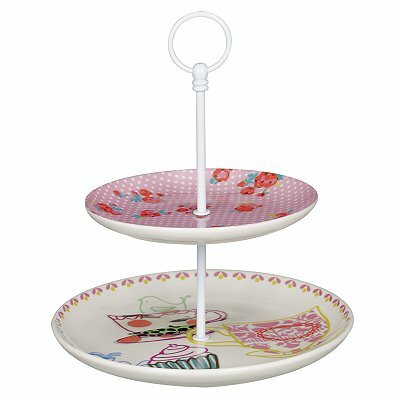 A similar cake stand is actually sold for £22.50, except the bird is painted on the stand instead of being perched on top. The website has more items that match these two along with tons of other great! I live in the UK. Happy to send this tea towel to you. Use my email to PM me if you like. Cheers.